Happy Friday friends! 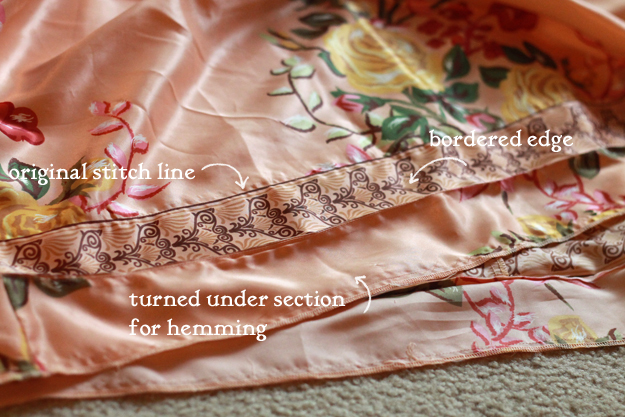 One of my latest thrifted purchases needed altering, so this tutorial is how to shorten a bordered hem. 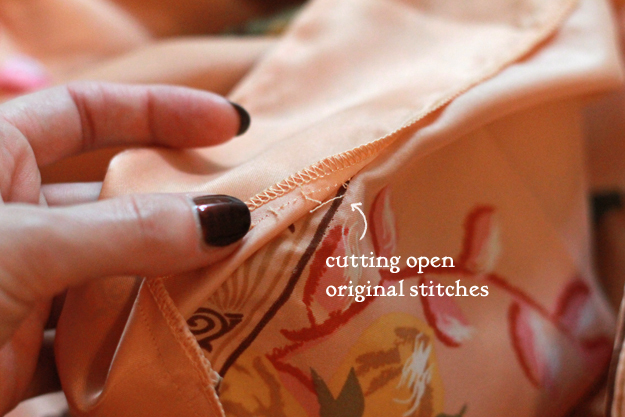 It's very similar to sewing an original hem (for jeans). 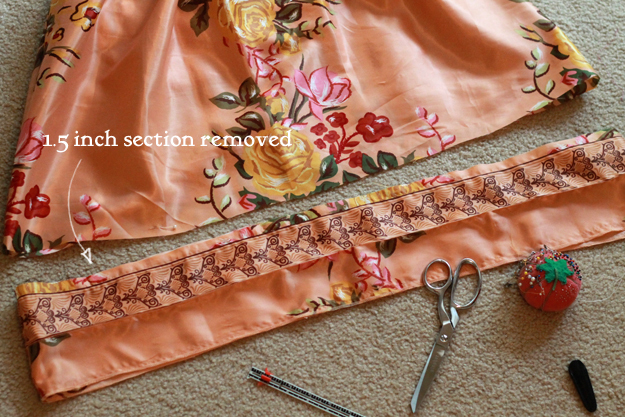 I wanted to hem this dress 2.5 inches so here is the step by step. 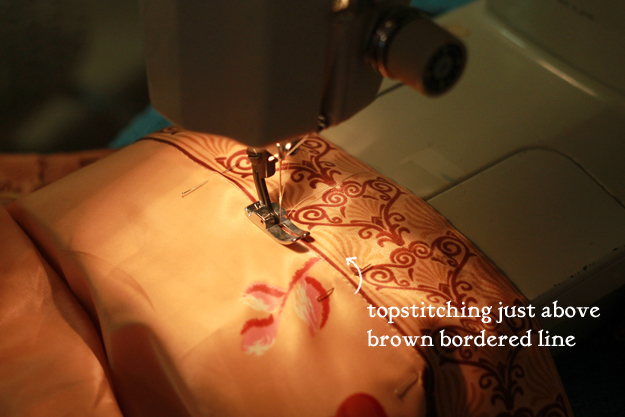 Cut open stitches from original hem. Measuring 2.5 inches from top of border, I made a mark. 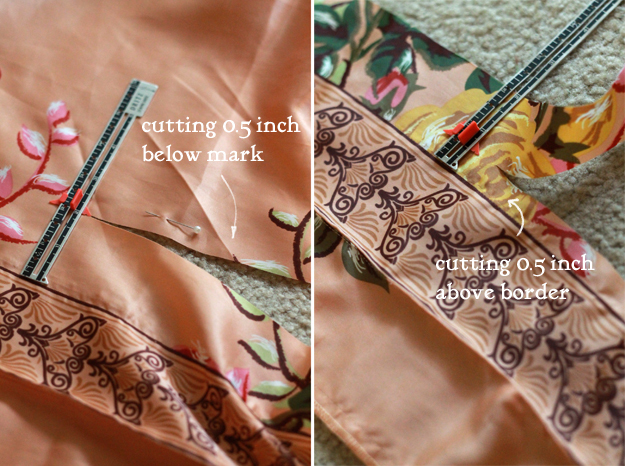 Then, I cut off the bottom of the dress leaving a 0.5 inch seam allowance. 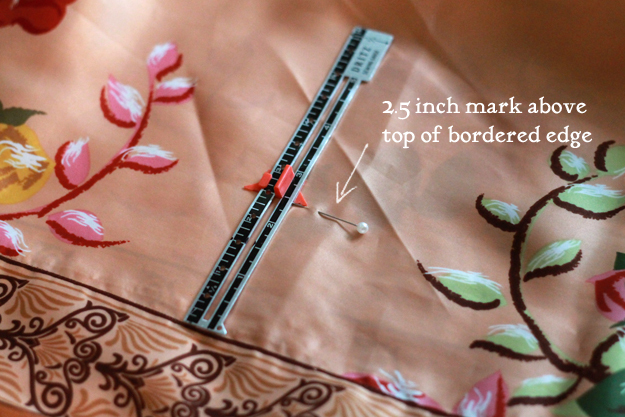 Next, I measure a 0.5 inch seam allowance just above the border and cut off the excess. I ended up removing about 1.5 inches. 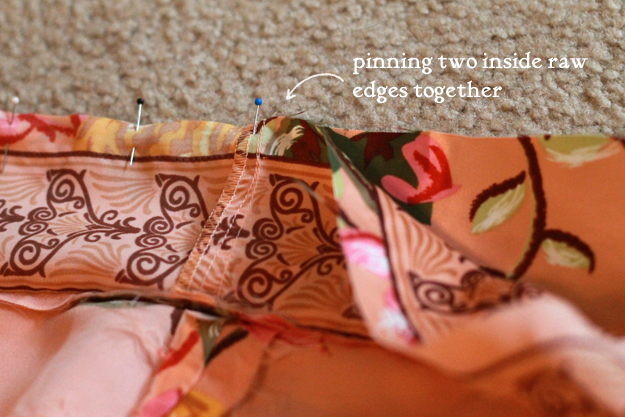 Pinning the "right" sides of the fabric together, I sewed just above the brown border. 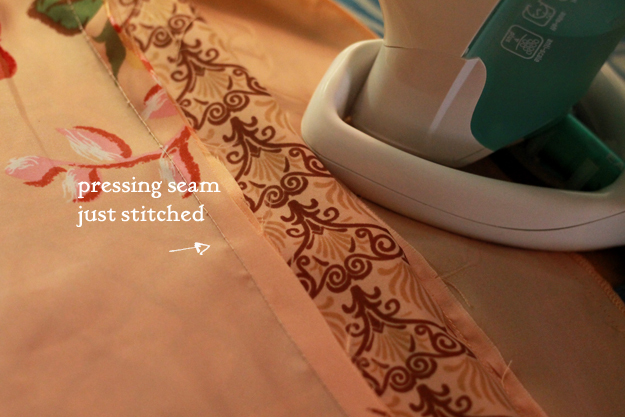 I ironed the new seam towards the hem. I folded the underside of them hem (originally cut open in the first step) and pinned in place. 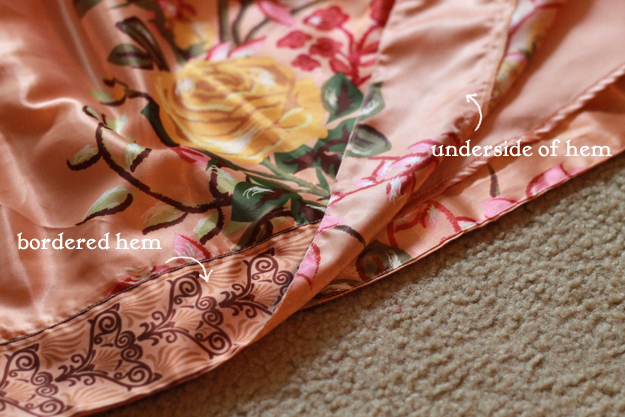 I topstitched the underside of the hem just above the brown border, encasing the raw edges from step 3. After that, I pressed the hem again and ironed the rest of the dress. That's it for this tutorial. Overall, one of the easier ones. Hope you enjoyed! Ugh I am sweing incompetent. I need some lessons! love this! You are amazing!!! xO! Mary Ann, you are an expert in sewing! I could've never managed that!! Great job! I would have royally messed that up! The dress looks amazing! Take care! Lovely, lovely, lovely!!! A beautiful dress!!! And I admire your sewing skills. Great tutorial! I can't believe this is thrifted! It's so adorable and it looks perfect on you! 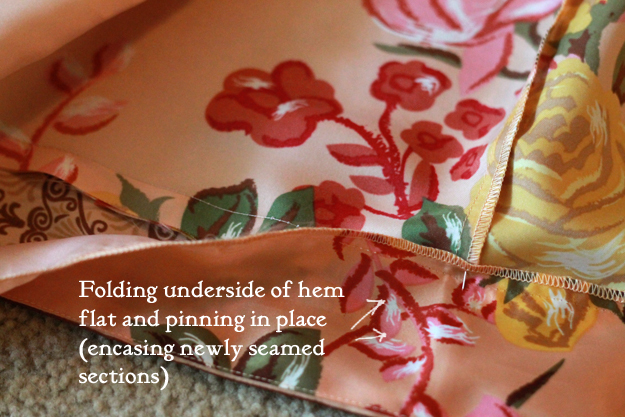 Such a great little fix--that dress is gorgeous! Sewing is about the only crafty thing I can't do. You did a great job! Love the dress! Thanks for commenting on my blog and I hope you guys enjoy your seafood boil! Following you! Hope you will follow back! Pretty dress, and I think you are an expert in sewing. Great job. great job, I´ve done to follow you. Oh wow, that is a lot easier than I would have thought. I'm a novice sewer, but I think even I could do that. Thanks so much for this! I love this DIY. 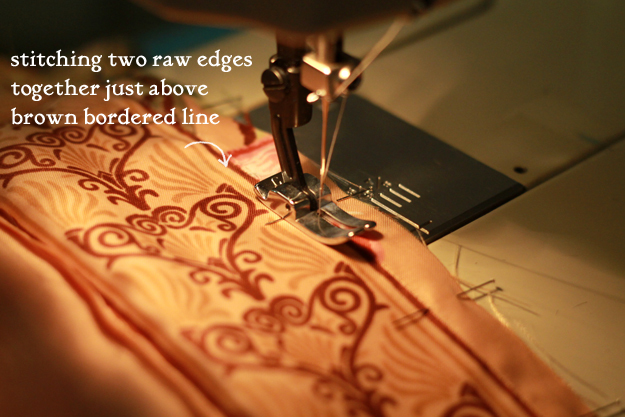 I am short so almost always need to take dresses up but never even thoughtit was possible on those with a border pattern. I love the dress, very pretty.